There was no doubt that when Toy Story 3 was released that it would become a family favorite. We love all the Toy Story characters, and they have certainly been a part of some of our most memorable Disney vacation moments. It is hard to believe that such a cuddly looking, strawberry-smelling stuffed bear could be a villain, but Lotso plays just that role. 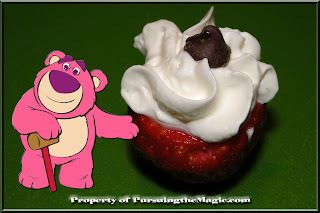 We decided to bring a positive spin to this character with a sweet and delicious strawberry recipe, that is fun and easy to create. This is another recipe that will give your child an opportunity to use their cutting skills. Plastic knives are a great tool to teach your child the proper ways to cut. The strawberries can be a little tricky, but it only took one or two each before my children were "pros." Use the paring knife to create small "bowls"
The adult should use the small paring knife to cut out the center of the strawberry, being careful not to cut through. This will make the strawberry look like a small bowl. Whisk the pudding mix with the 2 cups of milk for 2 minutes. 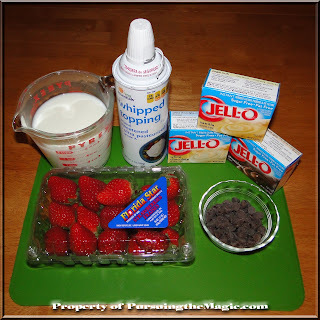 Pour pudding immediately into the quart size storage bag and seal. Place in the refrigerator for about 2 minutes, so that it will thicken enough to be easy to work with for the kids. Remove pudding from refrigerator, and, leaving the bag sealed, snip the bottom corner of the bag. Use this to squeeze enough pudding into each strawberry to fill them. If it is difficult to squeeze the pudding through, cut a little more of the bag to create a larger hole. 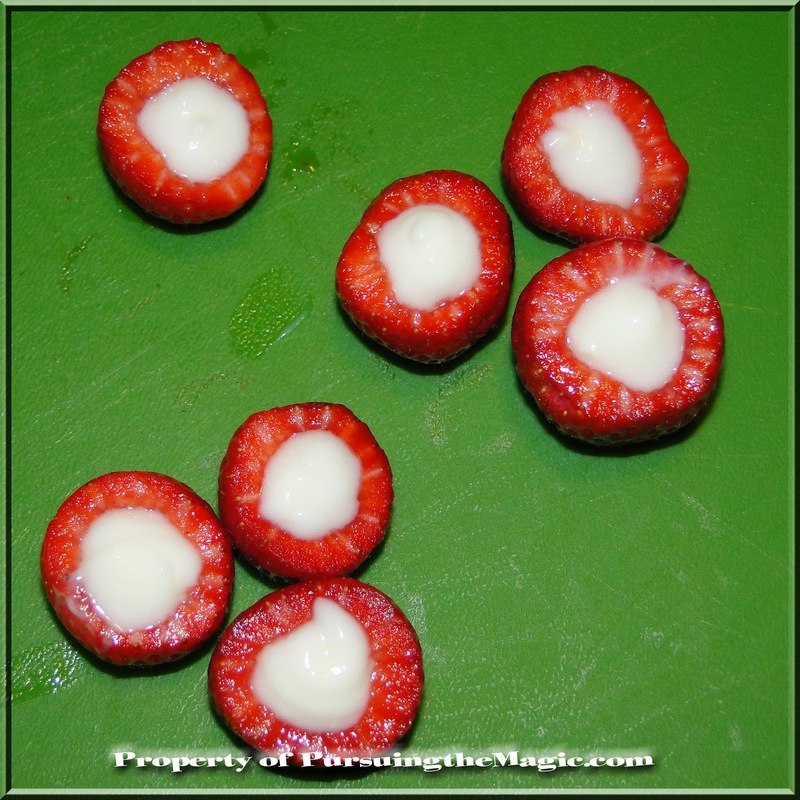 Top each filled strawberry with whipped cream. 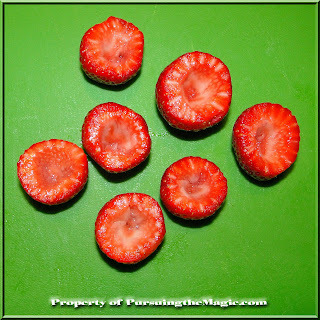 Decorate the tops of the strawberries with sprinkles, chocolate chips or anything else that your child would like to add. These easy to make treats are a favorite here. Though in this recipe I have listed white chocolate flavored pudding, there are certainly plenty of other flavors to choose from, from chocolate to banana and even in the summer our local grocery store carries a pina colada flavored pudding. Like I say in all these recipes we share, choose the flavors that your child loves best. Oh, they look so good! I would make them myself...but I'd have a hard time not eating them all myself, lol!! Deb, we ate all of them in one sitting! :-) These are particularly great on a hot summer day!